The article introduces the world of littleBits, including different parts, possible projects, and STEM opportunities. These colorful little circuit blocks allow you to build a variety of cool devices and gadgets. What’s the secret behind these small but powerful circuit blocks, and how can makers use them in electronic projects? In this article, I’ll introduce littleBits, followed by the external contact points and what types of electronic gadgets and devices can be built. In the next project article series, I’ll discuss how to build a remote-operated audio oscillator and control it with any standard IR (infrared) hand remote control. littleBits electronic modules include plastic bitSnaps that have three metal pins for providing the electrical connections. The bitSnap electrical connections are shown in Figure 1. To reduce error in building a gadget or device, small magnets are placed inside the littleBits bitSnaps. The electronic modules will connect to each other when properly attached. Incorrect electronic module connections will repel each other. The concept behind using magnets is to remove frustration from the build phase of an electronic project. Therefore, the attention and focus is on experimentation and the application of the desired electronic gadget or device you’re working on. The building convention of littleBits is a based on basic color scheme. The color scheme is as follows: blue modules are power, pink modules are input, and orange modules are output. Figure 2 shows the basic color schemes used in building a variety of electronic gadgets and devices. This color scheme provides a method of designing your electronic gadget and device in a logical and orderly manner. Next, let’s explore what devices can be built with littleBits. Figure 2. littleBits uses a color scheme to aid in building electronic gadgets and devices. Image courtesy of littleBits. 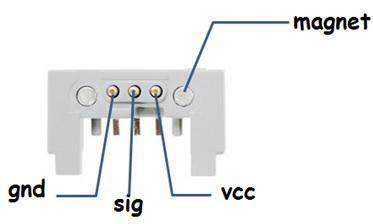 The figure below shows the actual littleBits modules of these input control devices. To place the button or the light sensor bits in a remote-control application requires using extension wires. The extension wires will provide a distance, “d”, that separates the input control device from the remote-control circuit box. Attaching the extension wires will allow the button and light sensor to be located remotely from the control device. “Hardwired” is another term used for this type of control. Figure 4 shows a concept drawing of how to create a remote-control application. Figure 4. A basic concept diagram showing how to create a remote-control application with a littleBits button. To accomplish building a “hardwired” remote control device, littleBits provides a wire bit. Figure 5. You can build hardwired remote-control devices with littleBits using a wire bit. 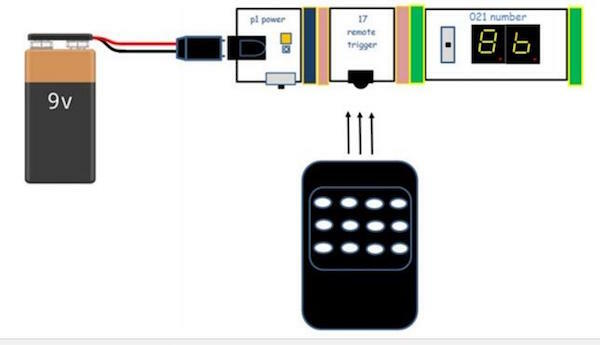 This remote-control application can easily be applied to the light sensor bit as well. The remote trigger bit can operate distance-based devices using an IR(infrared) handheld remote. Therefore, the remote bit has a greater distance “d” as compared to the hardwired or tether method shown in Figure 4. The remote trigger provides a greater control distance, which allows a mobile method of operating electrical-electronic devices. Additional information on building an IR Remote Control Tester can be found in my Arduino Electronics Blueprints book published by Packt Publishing. Figure 6. An example of an IR remote control application using littleBits. STEM (science, technology, engineering, and mathematics) and STEAM (science, technology, engineering, arts, and mathematics) projects can easily be created using the littleBits modules. 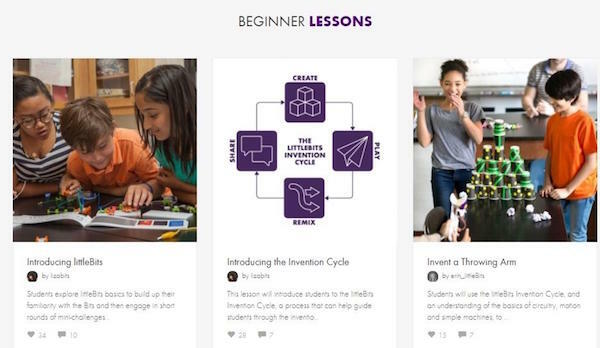 The littleBits educator’s website has a variety of lesson plans and projects addressing STEM and STEAM concepts in a classroom or training setting. The lesson plans and projects were created for educators by educators. Figure 7. The littleBits education page provides a variety of STEM and STEAM lesson plans and projects. 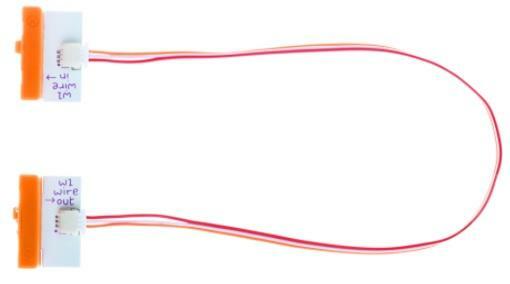 Image courtesy of littleBits. With a variety of STEM and STEAM lesson plans and projects available, you can custom make educational technology devices using littleBits. Educational technology allows learners to engage with the presented classroom topic using smartphones, mobile devices, websites, electronic trainers, and education software. Creating educational technology devices is quite easy to do with littleBits, and it’s only limited by the maker’s imagination. 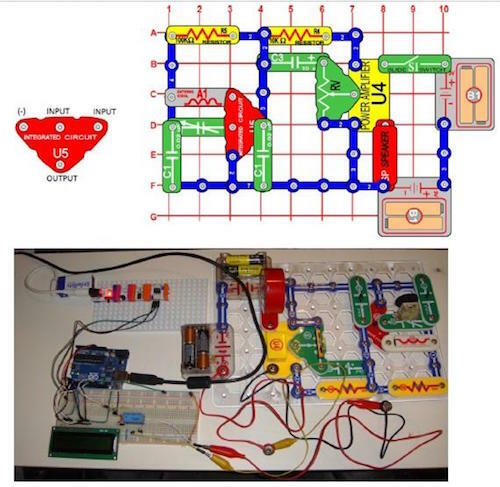 To illustrate, I prototyped an educational technology product to explain the operation of radio electronics and communication systems using a littleBits remote trigger, an Arduino, an LCD, and SNAP circuits. Figure 8. An educational technology project created using a variety of electronic parts. The variety of electronic parts will allow learners to build a SNAP AM radio. Also, the project will allow learners to control the SNAP AM radio circuit using the littleBits IR remote trigger bit and an ordinary IR handheld remote. For details of this project, check out my Arduino Electronics Blueprints book.